Welcome to my mini-reviews (minor spoilers) and comparison piece for Tron and Tron Legacy two movies which I watched over the weekend on Blu-ray. We'll kick off with the original Tron which was released back in 1982 starring Jeff Bridges, Bruce Boxleitner and David Warner. It tells the story of Kevin Flynn who while trying to prove his video games were stolen by Ed Dillinger provokes a response from an AI (Master Control Program) which brings him into it's domain. In this world programs are self aware and operate in a social structure and currently the society in fashioned as a totalitarian regime where individual freedoms are removed and dissidents sacrificed in the games. 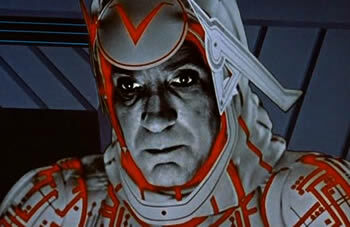 Kevin in the guise of a "user" befriends the creation of Alan Bradley (Bruce) named Tron a program designed to oversee everything including the Master Control Program and while on the gaming grid they along with Ram played by Dan Shor escape and endeavour to confront and finally eradicate the hold the MCP has over this world. Tron was released by Disney and directed by Steven Lisberger and at the time was a major step forward in the use of computer animation in movies infact it pushed the limits of what was possible and while it's certainly aged if you can look beyond the issues with merging live actors and CGI it still an impressive piece of work. Tron Legacy was released last year and despite the long gap between the two movies was able to bridge it very easily and it certainly helped that Jeff and Bruce were able to reprise their roles and the use of cutting edge image manipulation to bring us a "young" Jeff Bridges in the role of "Clu" added something special. In this movie Flynn vanished a couple of decades ago and the Encom corporation has slowly turned into a corporate money grabbing machine despite the best efforts of Alan Bradley and the annual monkey wrench antics of Sam Flynn played by Garrett Hedlund. In the real world time has moved on and in the computer realm a revolution has happened thanks to the influence of Flynn and his constructs but ultimately their system has been corrupted in the same way Encom has been and Flynn unable to "escape" has watched it happen. Sam Flynn in just a unlikely manner as his dad is taken into the electronic world and as before is put on the grid to fight and probably die but he is a "user" and adapts quickly and breaks the stalemate between the opposing forces in this world. The added ingredient of Quorra played by Olivia Wilde brings more depth to the story and at least partially explains how Flynn senior thought he could changed the world, both worlds in fact and together father and son fight to escape and prevent the invasion of the human world. Tron Legacy has a much larger ensemble cast than Tron along with those already mentioned we have notable actors namely James Frain ( Jarvis) and Michael Sheen (Zuse) and is infact a much larger movie in terms of scope and story and it goes without saying that it maintains the reputation of the franchise for pushing back the boundaries of what is possible. One area where is certainly sets the standard is the Daft Punk soundtrack which quite frankly is the best collection of music I've heard and yes owned in years, it is a masterpiece of creation. To summarise I enjoyed both movies but I have to say that I prefer the original Tron in terms of the story telling, while it is perhaps more basic it's done better and makes more sense than Legacy. On the flipside there is no denying the visual and auditory excellent of Legacy but I don't think it sells it's narrative well enough but I have hopes for a sequel, that could be very special given the groundwork which has been laid. I watched both movies yesterday, parts of Tron looked spectacular but in high definition you could see every flaw and every special effect that didn't quite work ( and there were more than a few ), it might have been nice if Disney spent a little cash and fixed a few things, not update or change but fix. I watched the 3D Blu-ray of Tron Legacy and frankly don't bother, it in no way improved the viewing experience and the changes in aspect ratio every time the movie went into one of it's lacklustre 3D sequences started to get annoying.